Nipping Floating Pennywort in the bud! THIS spring, work is under way to control and remove floating pennywort from the mid-lower reaches of the River Colne Valley, which crosses parts of greater London and Buckinghamshire. The project is part of a joint venture between the Environment Agency and Groundwork South – who are the driving force behind the ColneCAN (Colne Catchment Action Network) partnership, with members including anglers, water companies, local authorities and the Canal & River Trust. The Lower Colne Catchment Floating Pennywort Management CVFC Plan is a two-year pilot project that aims to use a collaborative approach in improving the local water environment. The plan is designed to unite relevant local groups and organisations to restore and enhance the River Colne network and wider water environment. We are very excited to be working with our local partners to manage and monitor the spread of floating pennywort. Large rafts of the plant can affect the oxygen content of rivers, smother important habitats and reduce biodiversity. It can also potentially increase flood-risk and spoil amenity use. Controlling floating pennywort can only be achieved with the continued co-operation from the river community. We need river users and riparian owners to be observant of any new growths and report via the CVFC NNIS App*. This will ultimately help to significantly reduce the spread over the summer when plants can grow up to 20cm a day in the warmer temperatures! I’ve seen first-hand how floating pennywort affects the valuable habitats the Colne provides for local wildlife and the impact it has on recreational activities, such as angling. We have surveyed the range and severity of the species throughout the river network, and now have a management plan that sets out a strategic means of reducing the range of floating pennywort via a programme of annual control. This year, we begin our control programme, and our contractor will be removing pennywort on a monthly basis between Troy Lake and Denham Country Park. 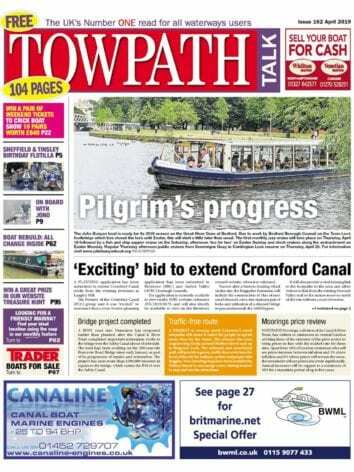 We’re also supporting local stakeholders in controlling floating pennywort on their patch. A £10,000 fund will be made at the beginning of April for local partners seeking to deliver volunteer workdays to remove the species. We hope this will help maintain key sites in the lower catchment and enable local people to contribute to the good work being delivered. Floating pennywort is a non-native species of plant, introduced to this country as an ornamental aquatic plant. It tends to favour slower moving watercourses with slack edges and backwaters. The River Colne has a variety of flow types and wonderfully wild corridors; such a complex set up means floating pennywort has plenty of hiding places. 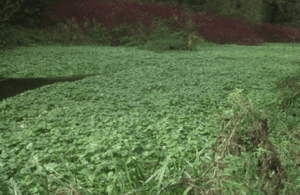 The Environment Agency is under no obligation to remove floating pennywort. However, we do have discretion to remove it under our statutory powers. Riparian owners are also not obliged to remove it, unless it can be shown that they planted it, though if it is on their land they do have a duty to take reasonable action to ensure it does not cause damage to neighbouring properties.